If you thought you might watch a little racing this weekend to take a nice, relaxing break from the madness of the election, sorry! 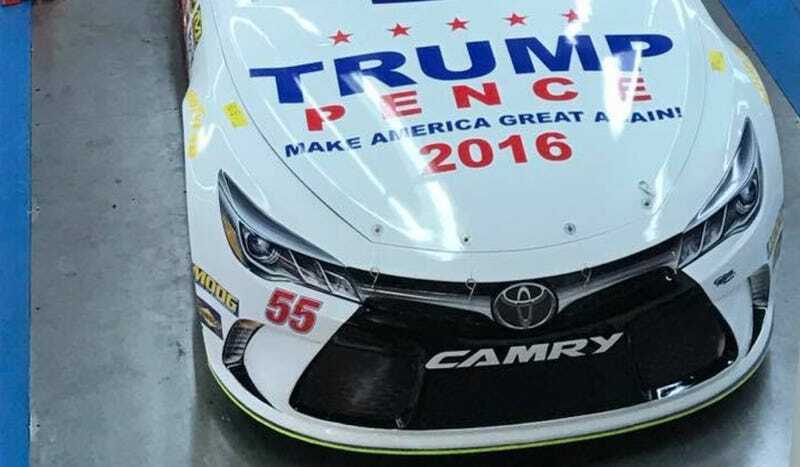 There’s yet another Donald Trump-liveried car in NASCAR. Driver Reed Sorenson will be running the No. 55 Premium Motorsports Toyota with a full Trump/Pence 2016 livery for this weekend’s Sprint Cup race at Texas Motor Speedway. If you’re wondering if this is a top team running for the title, have no fear, they’re in 39th place in the championship. It is unclear if Trump paid the Premium Motorsports team for the full-car sponsorship, or if the team voluntarily decked the car out themselves, given that was the case with the last Trump-branded NASCAR truck from a little while back. This very white car is bound to invoke horrifying flashbacks to bad election memes and uncomfortable conversations with the most politically insufferable members of your own family when you really just wanted to sit down and watch some racing. NASCAR’s relationship with Trump definitely belongs in the “it’s complicated” category. Trump’s election-season comments on Mexicans were inflammatory enough to prompt NASCAR to move its Camping World Truck Series banquet from a Trump property to a different location. Despite the series’ aversion to linking itself to a controversial candidate, individual members of the NASCAR community have endorsed the idea of a sentient bottle of spray-tanner leading the country, including NASCAR CEO Brian France. Unfortunately for whoever works in NASCAR’s battle-worn public relations department, it’s proven very difficult for the general public not to assume NASCAR as an organization backs Trump, particularly after France’s endorsement. On top of Trump’s trademark lack of a filter on his own mouth, numerous women are bringing forth allegations sexual assault and harassment against the candidate. In other words, this really isn’t the best look for a series that struggles to increase minority and female participation. Robinson also told ESPN that the car (unsurprisingly to us and/or anyone who knows the greater Dallas-Ft. Worth area) received positive reactions at Texas Motor Speedway.